Class of 1938. Myrl Johnson [female]. College Enrollment. Myrl spent part of her high school years at Garfield H.S. Class of 1938. Darwin Jones. Basketball. Track. ~ ~ ~ ~ Darwin Alma Jones was born on July 5, 1920 in Blanding, San Juan County, Utah. His parents: Marvin Willard Jones and Mary Ann Palmer Jones. Darwin married Mozelle Eloise Bugg on November 28, 1939 in Manti, Sanpete County, Utah. She was born August 13, 1919 in Roanoke, Virginia. Mozelle died on April 17, 2000 in Salt Lake City, Utah. Darwin A. Jones died on November 4, 1984 in Las Vegas, Nevada. Class of 1938. Jack Marshall. Boys' Athletic Club. Track. German Club. Drama. Class of 1938. Ruth Diana Miller. Wildcat Yearbook staff. Fauvines. Notre Maison. Drama. International Relations Club. Class of 1938. Leon Ross Milner. German Club, International Relations Club. Leon Ross Milner, 1st Lieutenant, U.S. Air Corps Reserve. Born March 1, 1920, Provo, Utah to Arnel Seaton Milner and Pearl Hamblin Milner. Death: Killed in Action, April 8, 1945. Leon R. Milner graduated from Brigham Young High School in 1938 and attended Brigham Young University for three years before serving a mission for the Church of Jesus Christ of Latter-Day Saints in the Southern States. He was an Eagle Scout in Troop 50 of the Manavu Ward. He married Barbara Payne Milner and was the father of two sons, Robert Seaton and Stanley Leon Milner. Lt. Milner joined the Air Corps Reserve on June 2, 1942, and entered training on March 1, 1943. He went overseas on January 1, 1945, where he earned the Air Medal with several Oak Leaf Clusters and a Presidential Citation for his action in Germany. He was the lead pilot of a B-17 (Flying Fortress) which received a direct hit in the gas tank during a flight over Hof, Germany. The plane burst into flames and exploded just a few seconds after Lt. Milner had assisted the last of his crew out the escape hatch. Four members of the group survived. 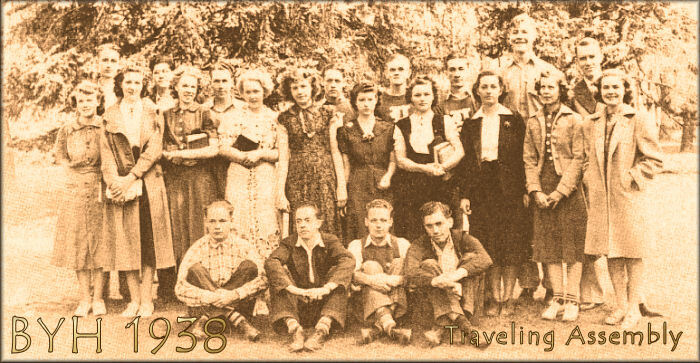 Class of 1938. James Maeser Mitchell. Vice President, French Club. Drama. International Relations Club. HIS OBITUARY: James Maeser Mitchell died November 24, 1997 at Utah Valley Hospital after a short illness. Born March 29, 1920 in Parowan, Utah, to L.W. Mitchell and Beatrice Maeser Mitchell, he lived in a number of southern Utah towns until 1926 when his family moved to Provo. Jim attended the Parker Elementary, Farrer Junior High, and graduated from BY High School. He married the former Mary Veone "Lucy" Hopkins on July 3, 1940 after which they settled in Provo. He worked for a time at Provo City Power, helped with construction of defense plants, and was one of the first electricians at Geneva Steel. He was drafted into the Navy in June of 1944 where he served until November, 1945. Upon completion of his duties in the service, he returned to Provo and resumed his career at Geneva Steel. He retired in 1982. Jim was well-known as an excellent builder and electrician. He spent countless hours in helping family and friends in many different kinds of home improvement projects. He was a long-time member of the Utah Bowler's Association, and also a member of the Provo Elks Lodge. Jim is survived by his wife and 5 sons: James Edward (Regina), William Blair (Lorena), David Robert (Donnetta), Thomas Alan (Dixie), and Paul Michael; four sisters: Mrs. Allen Colledge (Joanne), Mrs. Donald Jones (Georgia), Mrs. Thayne Murray (Mary), and Irene Mitchell; one brother, John William (Belva); 14 grandchildren; and 17 great-grandchildren. He was preceded in death by his parents, two brothers: Harold and Paul, a sister, Clara, and a grandson, Zeke. Funeral services were held in Provo on Saturday, November 29, 1997. Interment, Provo City Cemetery. A graveside service will be offered by the B.P.O.E. #849 Elks and Military rites will be accorded by the V.F.W. District #4. Donations can be made to the Provo Elks Lodge Christmas Fund. [Provo Daily Herald, November 26, 1997] ~ ~ ~ ~ OBITUARY OF HIS WIFE: Mary Veone Hopkins Mitchell, known to friends and family as "Lucy" or "Grandma Lucy", passed away March 31, 2006 at the Orem Nursing and Rehabilitation Center, after suffering through a long illness. She was born May 28, 1921 in Provo, Utah to Adelbert Blair Hopkins and Leola Scott. She attended schools in Provo, subsequently graduating from Provo High School in 1939. She married her husband of 57 years, James Maeser Mitchell on July 3, 1940 in Provo. Together they had five sons, James E. (Regina), William B. (Lorena), David R. (Donetta), Thomas A. (Donnie), and Paul Michael. Loved by those who knew her, Mom was a great wife and mother. She enjoyed many crafts such as sewing, crocheting, quilting, cooking and in her later years the art of painting. In the early 1970's, she and her mother, Leola, created the Stewart Candy Company where they made and sold hand-dipped chocolates. Mom would make the centers and Grandma would dip the chocolates. Mother loved bowling, an activity which she continued into her late 70's. She made many friends through the Orem Woman's Bowling Association where she served as Treasurer. She was inducted into the Orem Woman's Bowling Association's Hall of Fame in 1992, an honor of which she was very proud and which she cherished. Throughout their married life, Jim and Veone loved doing many things together. They enjoyed fishing, some hunting, and the occasional round of golf. In their later years, they focused significant time and effort to the support of the Elk's Lodge in providing Christmas to families in need. Veone is survived by her children; two sisters, Charlene Arrowsmith (Duane), Marilyn Wilkinson (Bud, deceased); and three brothers, Kay (Norma), Richard (Larue), and Frank (LaRae); thirteen grandchildren and 28 great-grandchildren. She was preceded in death by her husband, Jim; and one grandson, Zeke. Funeral services were held Tuesday, April 4, 2006 in Provo. [Deseret News, Sunday, April 2, 2006.] ~ ~ ~ ~ Children in 2006: James Edward (Regina) Mitchell [BYH Class of 1959]; William B. (Lorena) Mitchell [BYH Class of 1960]; David Robert (Donetta) Mitchell [BYH Class of 1962]; Thomas Alan (Donnie) Mitchell [BYH Class of 1966]; and Paul Michael Mitchell [BYH Class of 1966]. Karl G. Maeser was the the great grandfather of James Maeser Mitchell. ~ ~ ~ ~ His parents: Lycurgus William Mitchell (born 1890 in Manassa, Colorado to James Warner Bosnell Mitchell and Nancy Willmirth Johnson) and Beatrice Maeser (born 1890 in Beaver, Utah to Karl Frederick Reinhard Maeser and Sarah Caroline Shepherd) were married September 23, 1914 in Salt Lake City, Utah. They lived in a number of towns in Southern Utah until they moved to Provo in 1926. Their children included: Joanne Mitchell (Allen) Colledge; Irene Mitchell; Clara Mitchell (born 1918, died 1920); James Maeser Mitchell [BYH Class of 1938] (born 1920, died 1997) (married Mary Veone Hopkins); Paul Maeser Mitchell (born and died in 1921); Harold Maeser "Hal" Mitchell [BYH Class of 1941] (born 1923, died 1992) (married twice); John William Mitchell [BYH Class of 1944] (born circa 1926) (Belva) Georgia Mitchell [BYH Class of 1945] (born 1927, died 2000) (Donald) Jones; and Mary Mitchell [BYH Class of 1951] (born circa 1933) (Thayne) Murray. Class of 1938. Alice Mortensen. Notre Maison. Spent part of her high school days in California. Class of 1938. Arthur Orr. College Enrollment. Arthur spent part of his high school years at Wasatch Academy. Class of 1938. Norma Pearce. President, Notre Maison. Fauvines. Vice President, Junior Class in 1936-1937. Drama. Secretary-Treasurer, International Relations Club. Class of 1938. Philip Perlman. German Club, President. Track. Tennis. Boys' Athletic Club. ~ ~ ~ ~ Philip Perlman was born on March 15, 1920 and died on March 25, 2002 in the Holladay/ Murray /Salt Lake City area. ~ ~ ~ ~ HIS OBITUARY: Philip Perlman, age 82, beloved husband, father, grandfather, and great- grand- father died with his family by his side, March 25, 2002. He was born March 15, 1920 and was raised in Provo, Utah, the son of Sam and Anne Perlman. He married Miriam Pepper on September 1, 1940. Phil loved people and will be remembered for his resonating voice and strong opinions. He cherished the times he spent at Riverside Country Club as a founding member. He was proud of his family business, Provo Hide & Fur, and was grateful for his second career with Central Bank & Trust. He loved his community involvement; ranging from a Provo City Council Member, President of the Salt Lake City Jewish Community Center, to his over 50-year membership with the Masons. Phil had great passion for the University of Utah. He was a Charter Board Member of the Crimson Club. He and Miriam established the Perlman Award to honor excellence in student advising. He is survived by his devoted wife, Miriam; daughters, Nancy Perlman White (Clifford), Susan Perlman Robinson (Edward), and son, Michael Perlman (Patricia); his grandchildren, Allyson, David, Jeffery, Gregory, and Melissa; and five great- grandchildren. Graveside services were held on Wednesday, March 27, 2002 at the Congregation Montefiore Cemetery, 4th Avenue and P Street, in Salt Lake City, Utah. [Deseret News, Wednesday, March 27, 2002.] ~ ~ ~ ~ Philip Perlman's brother, Harold "Harry" Perlman, graduated from BYH in the Class of 1932. Harry Perlman died in 1936. Class of 1938. Wynston Robinson [female]. Notre Maison. Wynston spent part of her high school years at Franklin H.S. Class of 1938. Milton Roundy. Drama. Basketball. Boys' Athletic Club. Class of 1938. Sam Smoot, Student Body President 1937-1938. Business Manager, Wildcat Yearbook. Drama. Boys' Athletic Club. Scholarship. President, Junior Class in 1936-1937. School Sheriff. ~ ~ ~ ~ Samuel Parkinson Smoot was born on December 31, 1920 in Provo, Utah. His parents were Harlow E. Smoot and Anita Parkinson Smoot. Samuel married Mary Lee Atkerson. He died September 18, 1980 in Provo, Utah. Interment, Provo City Cemetery. Samuel P. Smoot was a veteran of World War II and of the Korean War.